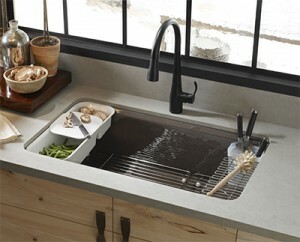 A true workhorse, the sink is as important as any feature in your kitchen. 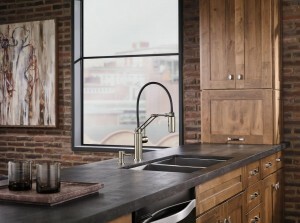 When it comes to choosing the right faucet or sink for your kitchen, the style is just as important as the functionality. Kenwood Kitchens offers a full range of faucet and sink options for customers in Lutherville, Columbia, Annapolis, Bel Air and throughout Maryland. Single-handled Faucet – Quick and easy, one single handle controls both hot and cold water. Some people greatly prefer the convenience of being able to switch cold to hot in one fluid motion. Dual-handled Faucet – Separate levers control the cold and hot water. Largely, these days, it’s a matter of personal style and preference as both single and dual work equally efficiently. Pull-out Spray – these are becoming exceedingly popular and come in both single and dual-handled versions. Makes for an easy time spraying down larger items that do not fit in your sink. Do make sure you can retract the neck easily, though. Hands-free – These days, the option does exist to install hands-free kitchen faucets in Baltimore similar to what you would find in a commercial bathroom. This option can be more environmentally friendly (as the sink should shut off when you no longer have anything under it) and somewhat safer for germs, especially as you handle raw meat. Wall-mounted – Some kitchens have faucets mounted directly into the wall or backsplash, with the sink or basin located below. This variety can look more elegant, but is not right for all kitchens. Bar Sink Faucets – Most frequently a kitchen faucet installation is mounted from the bottom, directly onto the sink. Really, it depends on your existing plumbing and walls. Reach – Often overlooked is the reach. Many clients forget when trying to imagine how a faucet will look, how far it can pull away from the sink. Many higher arc faucets can barely reach across your entire sink. You want to keep that in mind when you buy kitchen faucets. Height of Spout – in recent years, spouts have become higher and higher. This is useful if you want to fit a large pot under your kitchen faucet with ease. A straighter spout may have a more classic look, but will it function in your kitchen? For a kitchen faucet or sink that meets your family’s needs, call (800) 211-8394 or contact us to speak with a representative.